New research 'How Business Travelers Buy: Hotel Pricing in a Social World' from SAS and The Pennsylvania State University looks at how business travelers use online reviews to assess value. Who books a hotel nowadays without checking online reviews first? Travelers used to only have access to firm-generated information like location, amenities and class of service, and if they were lucky perhaps a guide book description. But with the advent of online reviews and ratings, they now have access to user opinions as well. 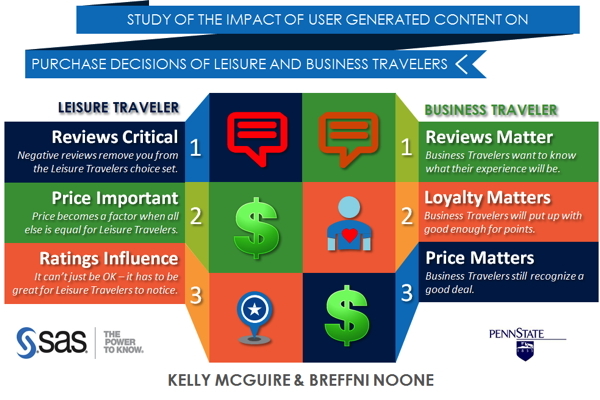 New research "How Business Travelers Buy: Hotel Pricing in a Social World" from SAS and The Pennsylvania State University looks at how business travelers use online reviews to assess value. Specifically, the new research examines which information they use and how it influences their value perceptions and ultimately purchase behavior. The study follows up on last year's "Pricing in a social world: The influence of non-price information on hotel choice," which looked at leisure travelers. Business travelers are not as sensitive to negative reviews. Unlike leisure travelers, business travelers are not overly sensitive to price and will choose a hotel with negative reviews. While they are paying attention to the reviews, negative reviews won't necessarily remove a hotel from the choice set if they're balanced against a favorable brand, price and ratings. Business travelers are highly influenced by their loyalty affiliation and might even put up with a hotel that's "good enough" if it's their preferred brand. The majority of survey participants stay with their preferred brand between 25 and 75 percent of the times they travel. Business travelers still recognize a deal. A deal still influences choice behavior. Hotels that drop rates as compared to the market will likely generate demand from this segment. However, unless the hotel is at the lowest price point within the competitive set, business travelers don't care about a few dollars difference. Business travelers looking for facts, not feelings. Review content was not a significant contributor to choice, nor was TripAdvisor Rank. However, review language was significant. Business travelers preferred more descriptive reviews over those with emotional language. If a review was positive or negative, business travelers wanted to know why. "The bottom line for revenue managers is that pricing isn't getting any easier," said Kelly McGuire, PhD, Executive Director of the Hospitality and Travel Global Practice at SAS. "You need to know your price and your competitors' prices to make profitable pricing decisions. But you also need to understand how your review sentiment stacks up. As this study shows, it's crucial to understand your customer segment mix. With leisure travelers, it's simple: negative reviews remove you from the choice set, but they otherwise prefer to pay a lower price. Business travelers make purchase decisions very differently." If you are primarily a business hotel, this study indicates that you have an opportunity to push price in a market, even if you don't top the reputation scale. This is particularly true if enough loyalty members are staying at the hotel. "Of course, the opportunity lessens if your reputation lags behind competitors," said Breffni Noone, PhD, Associate Professor at the School of Hospitality Management at The Pennsylvania State University. "In this case, lowering the price might attract a bit of business traveler demand, where it would not bring in leisure travelers. For lesser known brands competing against those with large loyalty programs, a reputation that exceeds the competition paired with a good deal could entice business travelers through your doors." All of these decisions, of course, are driven by a good understanding of your price position, your reputation position, your business mix, and most importantly, the hotel's business strategy.